Sony hits the UHD sweet spot with the UBP-X800 - a brilliant, beautiful 4K UHD player at a sensible price. Sony may have given UHD Blu-ray short-end of the stick with the PS4 Pro, but it now offers numerous dedicated 4K Blu-ray players: the custom-install-only UBP-X1000ES, the brand-new X700 and this mainstream torch bearer, the UBP-X800. The UBP-X800 isn’t just a UHD disc spinner, it’s a heavily specified media machine. In addition to playing Blu-ray, DVD and CD, it’s also compatible with Super Audio CDs and DVD-A discs, and plays nice with a barrel of High-Res Audio codecs. It's not perfect - we would have liked to see Dolby Vision and an even lower price that's more in line with the X700 - but it’s arguably the best specified Blu-ray player in its class even now, one year after its release. 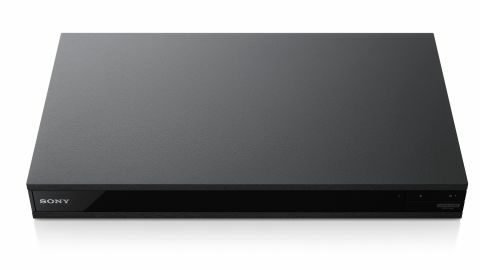 Cosmetically, the UBP-X800 is similar to Sony’s previous HD Blu-ray player, the UHP-H1. The design is clean and minimalistic. A full width 430mm model, it has a glossy fascia and distinctive stippled top lid. Connectivity includes two HDMI outputs, one v2.0 HDCP 2.2 enabled, the other an audio-only v1.4 output for use with home cinema receivers which don’t support 4K video passthrough. There’s also a single digital audio coax. The deck supports dual-band Wi-Fi and Bluetooth, with Sony’s LDAC headroom extension. The player also allows Bluetooth pairing with wireless headphones. Naturally there’s an Ethernet LAN jack for wired networks. On the front fascia is a USB 2.0 port, with a second on the rear. The deck’s half-size remote control sports a dedicated Netflix button. When it comes to build, Sony has really stepped up its game. The player employs the same Frame and beam design seen on its predessor, but adds additional reinforcement to better manage resonance. As well as new internal 1.2mm bracing struts, there are ‘foot beams’ linking the player’s feet. The deck weighs a reassuringly hefty 3.8kg. The UBP-X800 utilises the same MediaTek platform used by Oppo and Cambridge Audio UHD players, but you’d never guess that from the UI. Powered up, all we see is a tiled interface offering easy access to features and functions. This can be customised with content sources as you fancy. There’s a decent number of streaming services on tap, depending on locale: Amazon Video, Netflix and YouTube all support 4K streaming, although (at the time of writing) only Netflix offers HDR. The player also supports Miracast Screen Mirroring from compatible devices and is DLNA compliant. It instantly identified our NAS and Twonky Media servers. Audio file compatibility is impressive. The UBP-X800 plays 24-bit FLAC and DSD up to 11.2MHz, as well as WAV, AAC, MP3, APE and Ogg. To make the most of lossy files, theres Sony’s Low bitrate DSEE-HX sound enhancer. Video support includes MKVs, which is probably all most folks will need, as well as MPEG, MOV and AVI and m2ts, all upscaling to 2160p. Disc loading times are fast. The deck can have movies ready to roll in just 36 seconds. Picture quality is superb. In terms of resolution, this Sony delivers everything to the screen with zero artefacts or anomalies. Colour performance is exceptional. The player interpolates UHD with up to 4:4:4 subsampling, and presents band free colours. Unlike rival UHD players from Panasonic, the player doesn’t offer selectable output modes. Instead, it automatically sends the maximum amount of data within the capability of the connected screen. For example, if your 4K TV supports UHD at 60p disc, the player will output 2160p, with a frame rate at 60p, Deep Colour at 12bit, and chroma at 4:4:4. If your display can’t handle that, the deck gradually reduces the amount of data, in the following order of priority: resolution, frame rate, HDR, deep colour and colour space. Sony insiders tell me that final tuning involved image gurus from Sony Pictures, and you certainly get the sense that you’re watching studio grade master material. Night time action in John Wick 2 (UHD Blu-ray) proves a stunning showcase for high contrast imagery, with excellent shadow detail juxtaposed against vibrant neon colours. When it comes to High Dynamic Range content, the deck supports HDR10 as standard, but not Dolby Vision. This is only going to be a concern if you have a Dolby Vision compatible display. There’s been much speculation as to whether Sony can or will add Dolby Vision to the X800 via a firmware update, but the company has repeatedly told us this isn’t on the cards. If you don’t have an HDR TV, there’s an HDR-to-SDR converter which maps peak brightness and colour gradations. The player does a fabulous job upscaling standard Blu-rays. Star Wars: The Force Awakens, is a cracking disc by any measure, but spun by the UBP-X800 we swear that we could see see additional detail and texture. Video aside, the X800 is also a first rate audio player. Multichannel Hi-Res Audio, delivered over HDMI sounds sensational. Reptile, by Eric Clapton, from the album of the same name, in DVD-A, is magically immersive. The build quality of the UBP-X800 exudes class. The fact that the player is near silent is a testament to its build quality. Picture performance is first rate, not only with UHD Blu-rays, but also vanilla-flavoured HD discs too. It’s also a sensationally good audio source, with welcome compatibility for esoteric disc formats and High-Res Audio files. The major bone of contention with the UBP-X800 is the lack of Dolby Vision support. Putting aside the relative paucity of Dolby Vision Blu-ray discs, this would seem to be more down to product development cycles and timing rather than any PS4 Pro-style philosophical entrenchment. The lack of an analogue audio output limits system hook-up options, but we guess Sony need to sell you up to its UBP-X1000ES model some how. You can pay both more, or less, for a UHD Blu-ray player, but Sony hits such a sweet spot with the UBP-X800 that we suspect you won’t want to. Beautifully built, and capable of superb video and audio, this deck holds appeal for both home theatre fans and audio addicts alike. Sony has taken its time to roll out UHD Blu-ray, but the wait has been worth while. This is a class leading UHD disc spinner which is more than able to challenge higher-priced models. Image performance is excellent, and it’s a versatile music player too.